Bangladeshi border guards began surrendering early Thursday after opening fire on senior officers and paralyzing the capital in a 20-hour mutiny to demand better pay. Officials feared as many as 50 people could be dead in the violence. Bangladesh's Home Minister Shahara Khatun received about a dozen automatic rifles from surrendering mutineers at the Dhaka headquarters of Bangladesh Rifles  the official name of the paramilitary border guards. TV reports showed guards filing out of buildings in the compound and laying down arms, one by one. "The guards have begun surrendering arms after we have offered amnesty to them," Khatun told reporters while leaving the compound, adding that he believed the surrender would be complete later Thursday morning. The minister also had overseen the earlier evacuation of about 50 women and children trapped in homes inside the compound since the revolt erupted early Wednesday. They were mostly family members of officers attacked during the mutiny. The guards had stormed the headquarters Wednesday, opening fire on superior officers, and also seized a nearby shopping mall. Army troops were called in to surround both complexes, and the guards agreed to surrender when the government said it would grant them amnesty and discuss their demands. Hospital doctors confirmed that three bystanders, including a rickshaw driver, were killed and about 20 people injured. The standoff was the result of longtime frustrations over pay for the border guards that didn't keep pace with that of the army's  highlighted by rising food prices in the chronically poor South Asian country as the global economic crisis grows. Border guards reached by phone during Wednesday's standoff said they were upset that their officers had not mentioned their demands when Prime Minister Sheikh Hasina visited their headquarters on Tuesday. One guard in combat dress, his face covered in a yellow handkerchief, emerged from the compound and told television reporters that the army had "more facilities than what we get." For several hours, intermittent gunshots rang out at the headquarters. Smoke billowed. Soldiers shut down area streets as helicopters circled. Hasina then met and reached a deal with representatives of the mutineers, and the fighting subsided. Children trapped in the compound, aged between 5 and 16, were allowed to leave unharmed. 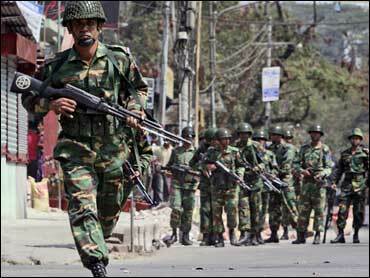 Government spokesman Jahangir Kabir Nanak confirmed that the guards had been offered amnesty. The revolt did not appear to be political, analysts said. It stemmed from long-standing grievances among the guards, who primarily protect Bangladesh's borders against smugglers. Food prices have risen some 30 percent in recent months, increasing pressure on the guards, who rely on government rations of rice, flour and sugar to supplement their incomes of about $100 per month. The guards get the rations for just three months, but regular soldiers receive rations all year. It was not immediately clear if the government would agree to all the guards' demands, which included a chance to participate in high-paying U.N. peacekeeping missions.